A few years ago, Lou Diamond, president and CEO of the salesperson development firm FOBIA, was conducting a workshop for some Merrill Lynch financial advisers. The workshop’s objective was to help the advisers develop an effective consultative selling approach, and during the role-playing part of the workshop, one of the advisers made a significant breakthrough. This particular adviser was struggling to win the business of an elderly woman, whose husband recently died. Although she was quite wealthy, she had never taken any steps to manage her finances. The adviser had met with the woman numerous times. He tried again and again to make her understand if she did not take action soon, her children would be left with a huge financial burden. So Diamond asked the adviser to pretend one of his colleagues was the elderly woman, and demo a conversation. 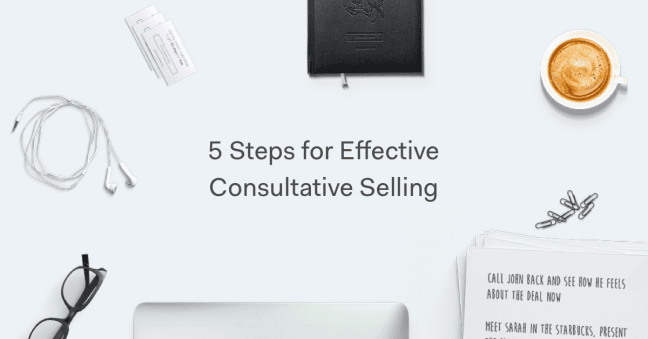 Developing an effective consultative selling approach relies on certain skills, techniques and best practices. But one defining characteristic of a good consultative seller is authenticity, a fact which Diamond reaffirmed that day at Merrill Lynch. Some call it a methodology, others call it a strategy. But really, consultative selling is a philosophy rooted in the fiduciary relationship between seller and buyer. A salesperson who practices consultative selling does his or her utmost to develop a holistic and nuanced understanding of the buyer’s needs and fulfill those needs with a customized solution. Similar to a lawyer who establishes trust and rapport with a client, a consultative seller seeks to do the same with a buyer. Rather than make a pitch to the buyer (“let me explain why you should buy our product”), a skilled consultative seller initiates a substantive dialogue with the buyer. It’s through this conversation where the buyer reveals how the salesperson can help them. In a way, a consultative seller influences the buyer to make the pitch, not the other way around. Despite the importance of a well-developed consultative sales approach, the majority of salespeople are not as skilled in it as they could be. A dataset published by the Objective Management Group shows that out of 350,000 salespeople across 200 industries, the average salesperson only exhibits 48% of the consultative seller skill-set. Whether we’re sifting through ancient documents, scanning Yelp reviews or reading a potential customer’s LinkedIn profile, research helps us shift the chances of success in our favor. Before initiating contact with potential customers, it’s wise to devote ample time to researching them and their business. Part of that research is for lead qualification. Is this person interested in my product? Do they have the authority and the budget to make a purchasing decision? Another part: competitive research. What products other than mine might the buyer be considering? What do those products have that mine doesn’t? What does mine have that theirs doesn’t? Proper research means becoming an expert in the buyer’s business. It means anticipating any and all questions the buyer may ask. It means entering the conversation with every conceivable answer at the ready. Make instant improvements to your lead qualification process with this four-step guide full of actionable sales advice. Think of your product or service as puzzle pieces. Every piece is accounted for and if put together correctly, they will form a complete image — a complete solution. You don’t have the box with the image on it. But the buyer does, and for you to understand how all the pieces fit together, the buyer needs to show it to you. And they will, bit by bit, if you ask the right questions. Asking may sound simple, but the simplest things are often the hardest to get right. This is because the first instinct of many salespeople is to come charging out of the gate with an armful of talking points. To build a real relationship, one that will eventually reveal the image atop the puzzle box, restrain that instinct. “What we have to do is ask the client — not tell — but ask the client what they need, what their pain point is, and how we can help them,” Diamond said. Can you walk me through your backup process? Then use their answer to drill into more detail. Do you backup daily? How much time do you spend on daily backups? What happens next? Are your backups completing properly? Have you ever lost any data? Did you lose business? By starting basic and drilling into specifics, you can begin to frame your questions around what your solution does differently. The better you are at asking, the less you’ll need to say, and the more listening you’ll need to do. But truly understanding requires active listening, which helps you absorb what’s being said, and what’s not being said. An active listener can read the subtext of the conversation. They can pick up verbal and nonverbal cues to flesh out their understanding. Furthermore, demonstrating to the buyer that you’re actively listening goes a long way in building trust. To borrow a phrase from Dale Carnegie, you should become genuinely interested in whomever you’re speaking with. A large component of active listening is knowing when not to talk. Sure, you found the buyer, you researched them until the lights went out and the cleaning crew arrived, and you initiated a conversation, so you might feel you’ve earned the right to talk the buyer’s head off. But the majority of that conversation should be spent actively listening, not talking. Leave the talking to the buyer. Also listen for the buyer’s values. Do they put particular importance on their team’s welfare, or are they more concerned about themselves? Do they value low cost over high quality, or vice versa? If you practice active listening, you will have learned much, but said little. Step 4: Communicate Your "Why"
This outburst was his why. The financial security of this woman and her family mattered to him. He wanted to help them, in earnest, and grew impatient when she didn’t seem to grasp his intentions. While standing up and shouting your why to a buyer is certainly not recommended, you should communicate your why nonetheless. This requires a softer touch. so rather than state your why outright, let your why color the conversation. Be enthusiastic. Be empathetic. Don’t be afraid to challenge the buyer over something you truly believe in. In short, be authentic. No one wants to do business with a two-dimensional salesbot. They want to do business with a real person. Want to Learn How to Influence Your Prospect's Buying Decisions? Get inside the head of your customers and take advantage of consumer psychology with this Psychological Selling Guide. Closing a deal doesn’t usually happen all at once. The buyer may need to bring your solution to his or her team for input. They may need to have a conversation with their CEO to determine if your solution is in line with their business strategy. This can take time; so part of following through involves helping the buyer work out the finer points. Rushing a buyer can quickly end your relationship. However, it’s imperative that you stay top-of-mind. If you asked good questions, actively listened and took comprehensive notes during the initial conversation, following through will be a matter of translating the information gathered into top-of-mind opportunities. For example, if a week goes by with no word from the buyer, consider sending them an article that ties in with something they said when you last spoke. If another week goes by, send them something else. Always be thinking about to follow-through. What will interest them? What will entertain them? What will help them? And perhaps most importantly, what is relevant to them? With the principles of consultative selling fresh on the brain, it’s time to hit the phones and start consulting. Focus on forming a bond rather than lobbing pitches. Moreover, you should work hard to understand the buyer’s unique needs, pain point and objectives rather than lumping them in with every other prospect’s. Use this walk-through as a jumping-off place, but be sure to weave your personal qualities into the consultative selling process as well. Communicate to the buyer why you want to help them. Let your unique personality shine through. Keep in mind that for the seller-buyer relationship to be authentic, both parties must open themselves up.